Hi Fitness Friends! I have some exciting things to share with you. I Finally Hired My First Assistant! Last week I hired an assistant. Her name is Maleah and she’s already doing a kickass job. I will be able to do more things now that I’ve acquired her help. I only wish that I hired one 2-3 years ago (I’ve had interns but no assistants)! If someone were to have told me ten years ago that in ten years I’d be spearheading a journal club, I’d probably have jumped in front of a semitruck. 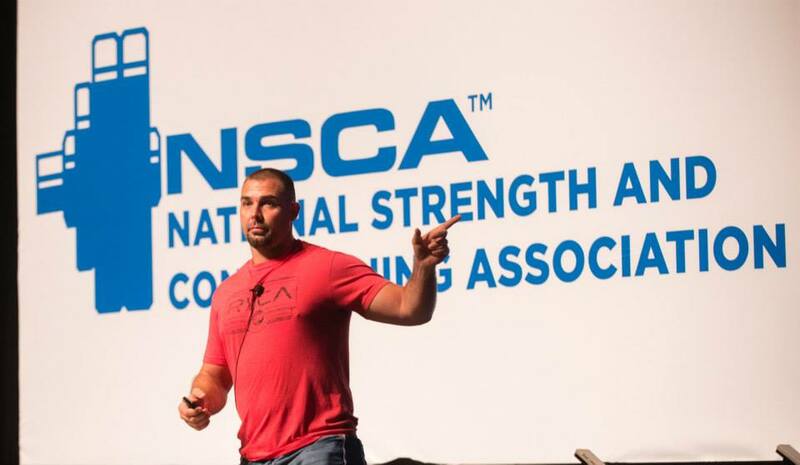 However, people change, and my life now revolves around teaching people sports science and helping lifters, trainers, and coaches realize their full potential. Basically, I want to do my part in equipping Arizona with intelligent lifters and practitioners. I visit commercial gyms and it pains me to witness the quality of personal training and training going on in my state of Arizona. I just purchased a projector, a screen, and 16 chairs (my gym can hold many more people than 16 but some folks will have to stand), and I’ve decided to start up a journal club to convene once per month. We will meet here in the Glute Lab for 75 minutes, and during this time I will review 2-3 brand new studies (30 minutes), provide some practical resistance training tips (15 minutes), and answer questions and have discussions (30 minutes). There will be no charge for your attendance, and you can be an athlete, a gym rat, a personal trainer, a strength coach, or a physical therapist and you’ll be welcome, as long as you possess a desire to learn. Male or female, old or young, strong or weak, I want you here if you’re passionate about strength & conditioning. I want to grow the club and eventually plan social get-togethers, have guest speakers (live and on Skype), have debates, and more. If we continue to accumulate, we can find a gym or some other venue to meet at. Criteria: You need to live in Arizona and you need to plan on attending most months (we will meet on Saturdays at 10 am). It’d be nice if you subscribed to Strength & Conditioning Research Review as well, but I won’t check up on that. If this is something you’re interested in, please email my assistant Maleah at maleah@https://bretcontreras.com to be notified about the first get-together in December. 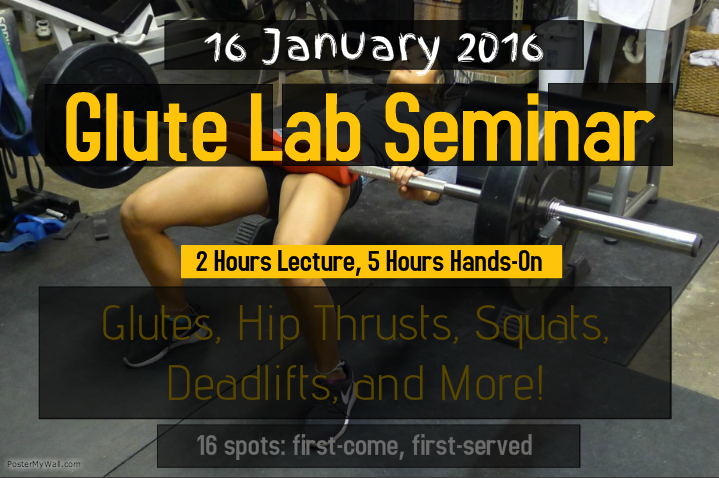 * The Glute Lab Seminar is open for anyone willing to travel here (journal club just local people though). So if you live in another state or country and want to visit, be my guest! When I spoke at Planeta Barcelona in Spain in September with my buddy Brad Schoenfeld, I experienced two important epiphanies. The first epiphany is that I learned that I love Spanish sangria! Aye caramba! The second is that I need to be conducting practical seminars on a regular basis. While watching Brad’s first presentation, I realized that my slides were going to be way too complex (biomechanically) for most of the attendees. I decided to throw an audible and spontaneously switch to a practical presentation. To make a long story short, I ended up spending 5 hours teaching the Spanish personal trainers the biomechanics of squat variations, deadlift variations, hip thrust variations, single leg variations, push up variations, bench press variations, and core stability variations. I realized at that time that this is my calling; it’s what I was born to do. It felt like all of my years of lifting, personal training, and biomechanics studies converged into the ultimate demonstration and explanation of exercise technique. I truly believe that this is a much needed seminar as it allowed me to discuss how anatomy and anthropometry impact mechanics, common faults, and effective cues. I also pulled something similar off when I went on a weekend vacation to San Diego to visit my family and ended up training 4 fit ladies for several hours going through the same exercises – it was a great success! It took me decades to attain the understanding of exercise technique that I currently possess, but I think I can fast-forward the average personal trainer’s understanding of exercise technique by 5-10 years in one day with these seminars. This is a rather exclusive event and I’m only taking on 16 attendees so that I can devote ample individual attention to everyone. Location is here at the Glute Lab (Phoenix, AZ), date is January 16, 2016, time is from 10:00 am to 6:00 pm, and cost is $399. Please email my assistant Maleah at maleah@https://bretcontreras.com if you’re interested in attending. Most of my readers follow me on Instagram and are aware of my Glute Squad. I currently have 8 members and I’d like 2-4 more female members. We train here in Phoenix, Arizona out of my garage (Glute Lab) at noon on Mondays and Fridays. 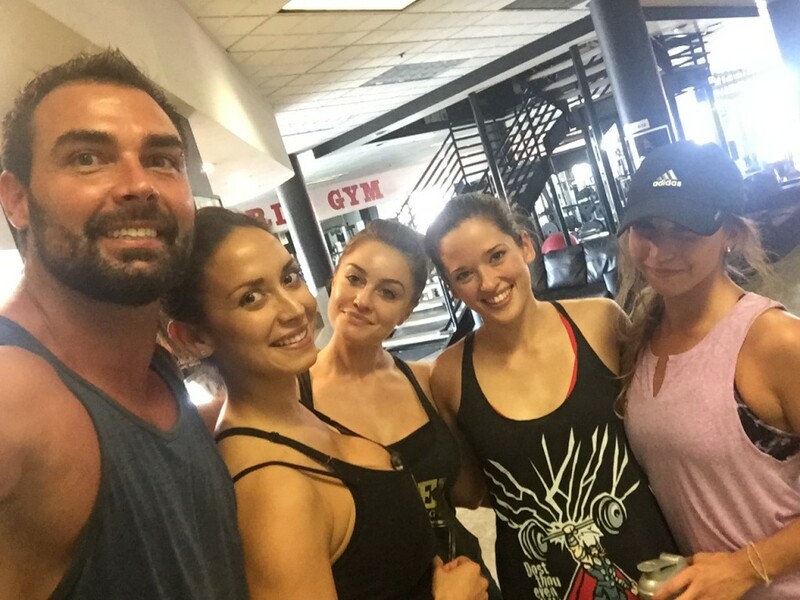 I’m looking for positive, fun-loving ladies who are also very serious, highly committed lifters. Preferably the potential members would be interested in competing in bikini, powerlifting, or both down the road, but that’s not mandatory. Cost is $200/month (less than $25/session). If you’re interested in becoming a Glute Squad member, please email Maleah at maleah@bretcontreras.com. Please include pics and a paragraph discussing why you want to train with us. One of my primary goals over the next decade involves significantly expanding the body of evidence pertaining to the hip thrust exercise. I would like to compare the effects of 6-8 weeks of squatting, deadlifting, and hip thrusting on performance. However, I don’t have any research assistants and would have serious problems training the subjects and measuring pre and post variables of interest. Therefore, I’m looking for researchers who are interested in carrying out this study, and I’m willing to fund it. Ideally, we’d have 15 subjects in each group (45 total) and have access to a force plate. I’d like to examine vertical jump, horizontal jump, 40 yard dash, 5-10-5 agility, medball rotational scoop toss, isometric mid-thigh pull, isometric horizontal pushing force, 3RM squat, 3RM deadlift, and 3RM hip thrust (10 performance variables!). Clearly this would be a comprehensive study requiring considerable time and effort. I’d be willing to pony up $7K of my own money just to see this research conducted (I’m so damn curious I can hardly handle it). Obviously I would never censor the research and would want it published no matter what the outcome. If you are a research professor, a grad student, or a research assistant who is capable of pulling off this study and are interested in collaborating, please email Maleah at maleah@https://bretcontreras.com. Did all of you see this? I promoted it on my social media (Facebook, Instagram, and Twitter) but wanted to make sure I posted it here on the blog in case any of you missed it. 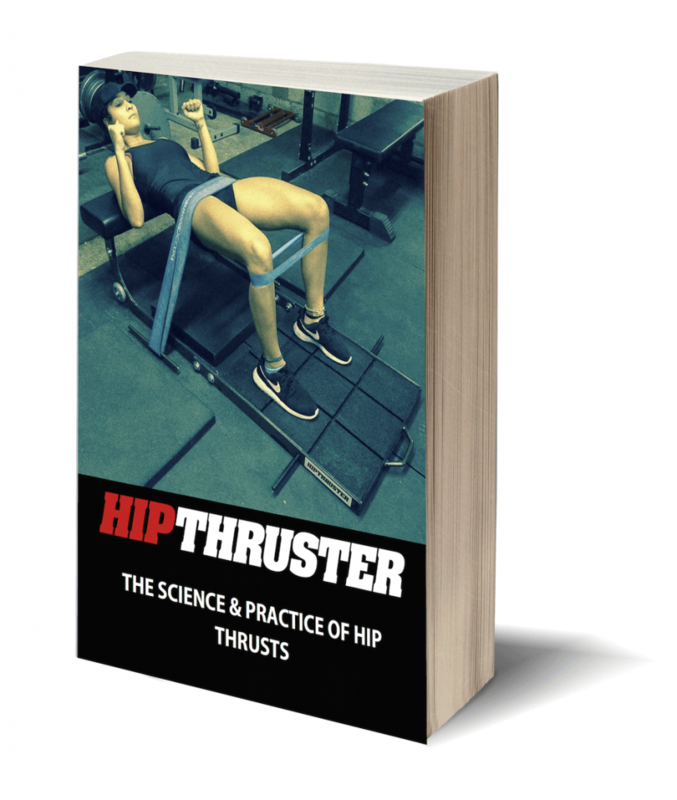 It’s a free 22-page eBook on the science and practice of Hip Thrusts! Click HERE to access it. Did y’all see this as well? It’s a summary of sprinting research, courtesy of Chris Beardsley. I was very happy to find that it was well-received in the track & field community. Click HERE to read it. You should read this sprint review ASAP! In 16 months, I went from 245.9 lbs to 226.7 lbs. 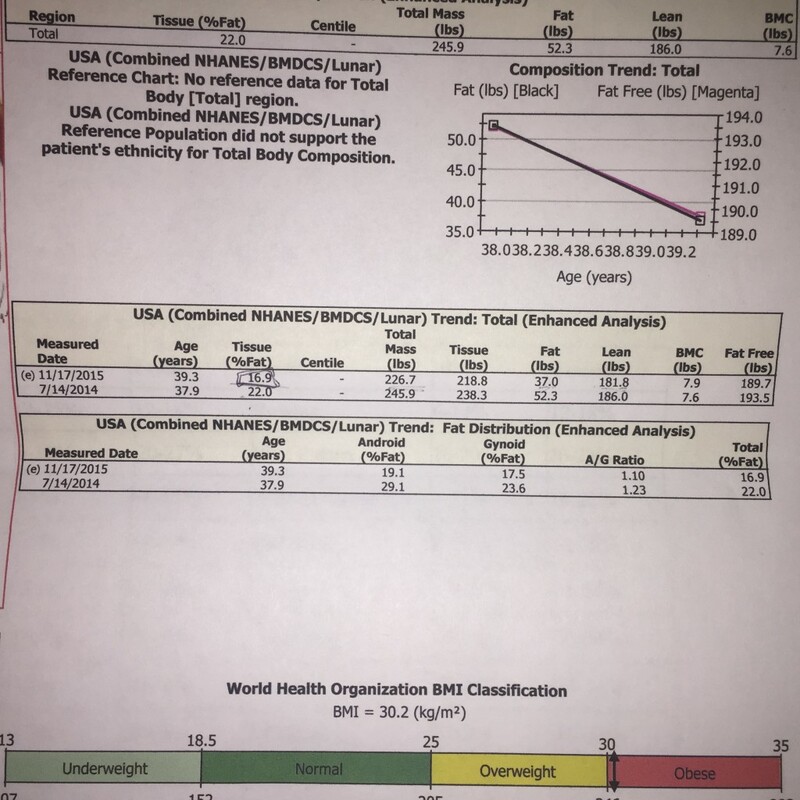 I lost 19.2 lbs, 15.3 lbs of fat, and 4.2 lbs of muscle while gaining .3 lbs of bone. I did this just by eating less calories, with no additional cardio and no significant changes to my strength training. It has not been easy due to my legendary appetite, but the results are well worth it (see my 5 Tips for Leaning Out article). After 24 years of lifting weights, I didn’t expect to hold onto all of my muscle while I dieted down 20 lbs, so I’ll take the roughly 80/20 split of fat loss to muscle loss. Below is what the difference looks like visually. 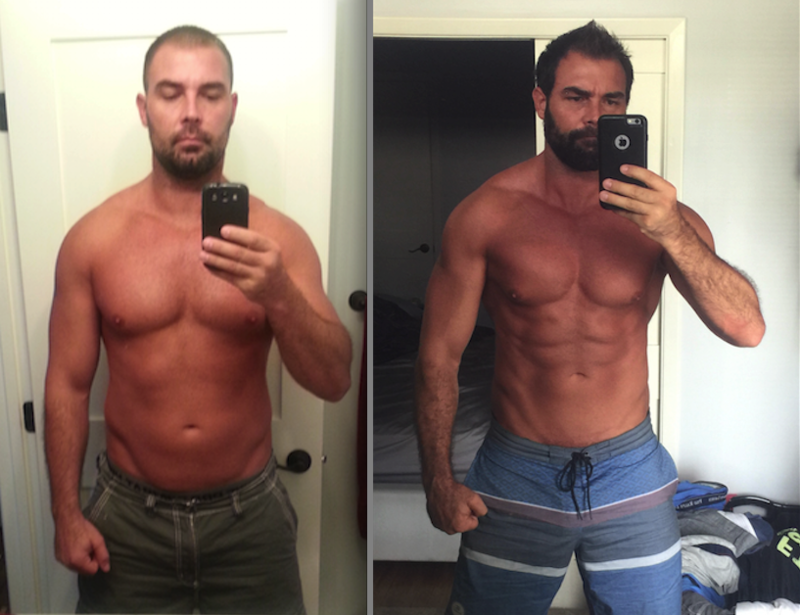 In the pic on the left it looks like I’m sticking my stomach out but I don’t think that’s the case (I never do that for pictures) – my eating was simply out of control as I was focusing purely on getting stronger at the time with no concern for my physique. In the pic on the right I’m flexing my muscles, so it’s not a fair comparison, but you can easily note the drastic changes to my physique. Pretty cool seeing the results of will-power and consistency! A follower of mine named Kristen (she wrote a blogpost for me last year HERE) sent me this picture. Many women have bony hips and therefore experience excruciating pain from barbell hip thrusts. 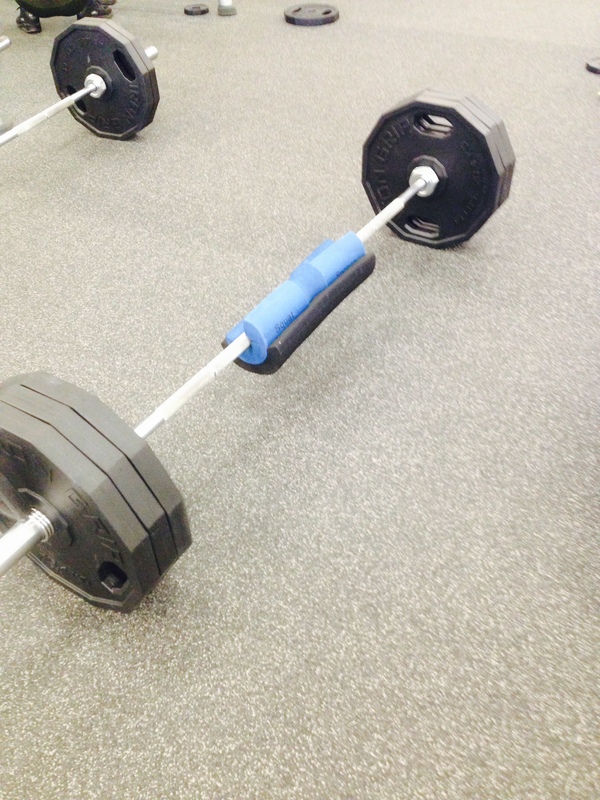 Kristen was one of these ladies, so she decided to wrap a Hampton thick bar pad (my old recommendation) around a Squat Sponge (my current recommendation) during heavy hip thrusts. Voila! No more pain on the hips. Okay fitness peeps, I hope you enjoyed the content. Have a great weekend! The post Random Thoughts and Important Announcements appeared first on Bret Contreras.